Thirty-one cosponsoring grassroots social justice groups and their supporters will march to “Shut Down Racism, War, and Bigotry on the One Year Anniversary” of grassroots resistance to the Trump administration. The march will take place on Sunday, January 21st, 1:00 p.m. 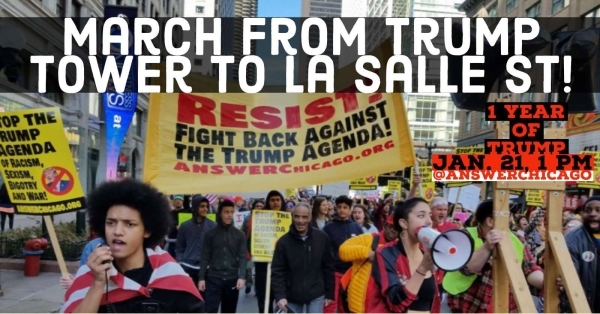 Participants will be gathering at the northeast corner of Wacker and Wabash in downtown Chicago. A year into his presidency, Trump, the One Percent, and the Establishment, feeling confident that they will not face resistance in the streets, have gone on the offensive, approving the racist travel ban, empowering racist police departments and ICE, attacking Native lands and the environment, promoting the Tax Plan assault, threatening LGBTQ rights, funding and escalating the Saudi genocide in Yemen, preparing for a disastrous war (Perhaps against Korea or Iran. ), backing election fraud against a progressive candidate in Honduras, threatening net neutrality, attacking the Arab and Muslim world by declaring Jerusalem the capital of Israel, and much, much more. We will not be idle. We will not wait another minute, month or year to take action. We will not wait until January 2019 in the hopes that a democratic-controlled congress will fix the growing crises that the people of this country and the world face. ANSWER Chicago, Black Lives Matter – Women of Faith, People United Against Oppression, Chicago Students Union; Freedom First International; Gay Liberation Network; Illinois Green Party; Centro Autónomo de Albany Park, Chicago; Anakbayan Chicago: International Coalition for Human Rights in the Philippines Midwest; Free from Harm; Chicago Veterans for Peace Chicago Chapter; La Voz de los de Abajo; Chicago Campaign to Expose Crisis Pregnancy Centers; Kofi Ademola, an activist in the Movement for Black Lives; International Socialist Organization; Refuse Fascism Chicago; Workers World Party Chicago; The Party for Socialism and Liberation Chicago; The Party for Socialism and Liberation Milwaukee; Chicagoland Teamsters Against Chump; Albany Park, North Park, Mayfair Neighbors for Peace and Justice; Chicago Socialist Alternative; Chicago Stop Moving Backwards; No War on North Korea; Wisconsin Bail Out The People Movement; Southwest Suburban Activists; March 19th Anti-War Coalition; No Amazon HQ in Chicago; Committee for Justice In Ayotzinapa; and DuPage County Green Party.